Shot in Ingólfshöfði in SE Iceland. The headland of Ingólfshöfði is also known as "Puffin Island" to tourists. To get out there you go on a haywagon-service run by one of the local farmers and bounce around for about half an hour on each way, but it's well worth the trip. Even if there are no puffins just the view (on a clear day, obviously) is fabulous. On the headland are about 300 000 puffins in the summer (mid june to mid august) and a 100 or so Great Skuas and a whole lot of other birds. 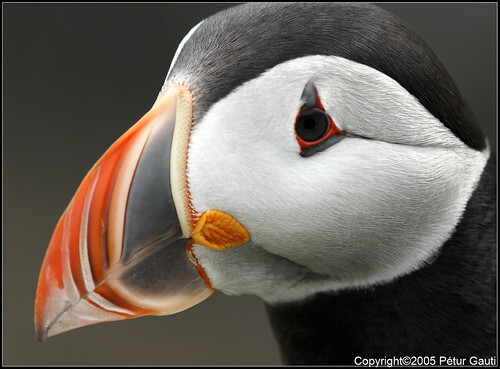 Puffins can be very photogenic and you can get very close to them if you do it slowly. For example, with this puffin I was a little over 1 meter away from it. To get even more of a profile I held the camera in front of me, at arms length, and aimed it as I could at the puffin. The distance from front of lens to puffin was maybe about a meter, or little less (appx 3 ft). Since I held the camera as close to the puffin as I could get it, it was at arms length from me, so it was hard to compose the shot. I just aimed it the best I could through the distant viewfinder and hoped for the best. I took a whole lot of shots, but this was the best, almost perfect except for the slightly too tight crop of the top of the head. To get close to a puffin approach it very slowly and let it see you. Best is if you approach from above, so the puffin feels it can jump off the cliff and fly away if you get too close. Then you can get quite close. Move very slowly, esp your hands and your camera, everything must be in slo-mo, like in replay in sports.